I never planned to be a writer. But after years of consulting, church leaders asked me for the "book" version of my work. As I started the task, I focused not on creating not books, but user guides around master tools. Leaders need great tools, not just random ideas and stories for information or entertainment. 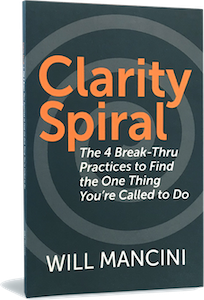 Clarity Spiral describes the four lifelong practices I have used and taught to find and align vocational vision. I wrote this book convinced that you can discover the dream God has for you and that you can proactively design a powerful life that releases all of the promise God put inside of you. Clarity Spiral is about maximizing your work potential and finding your dream job. The Clarity Spiral also happens to be the first master tool in a Personal Vision Journey offered through Younique, a training company that brings gospel-centered life design to people through certified coaches in the local church. 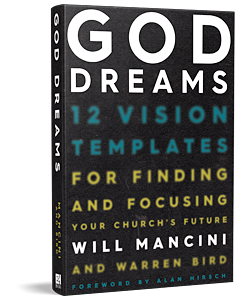 Published in 2016, God Dreams debuts the visionary planning tool called the Horizon Storyline. The book's ultimate purpose is to add greater meaning and freedom in the busyness of church ministry. 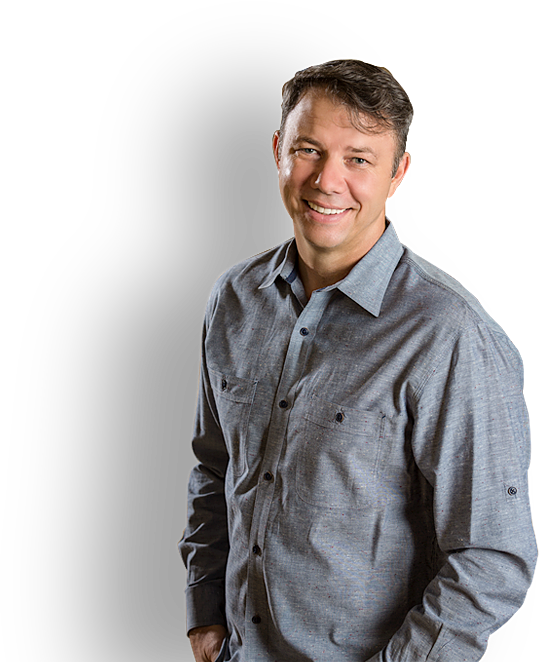 It does this by showing how to inspire others and focus your team around a specific, vivid picture of your church's next big dream. This book expands on the idea of "Vision Proper" introduced in Church Unique. Therefore it makes "volume two" of my life's work on church vision. I'm grateful for Warren Bird who helped me validate the most unique feature of this book—the 12 templates. Each template comes with biblical, historical, and contemporary illustrations of dynamic vision. The templates are just one step in a guided process as you build your own visionary plan. 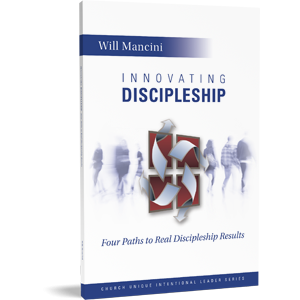 Innovating Discipleship provides a simple and powerful way to innovate your disciple-making strategy. The book helps you "think outside of the box" as you answer the question, "How do I want my church to be different in the next two years?" The book is built around a little formula [ 1 + 2 + 4 + 16 = ∞ ]: 1 whiteboard drawing, defined by 2 vision decisions creates 4 pathways to the future. These four pathways are "walked" using 16 super questions that lead to limitless ministry innovation. Innovating Discipleship "snaps together" with the book Church Unique and answers the question of when to change the "strategy" (model) and "measures" (results) sides of the Vision Frame. I answer these questions in ways the bridge the missional conversation with classic approaches to vision. 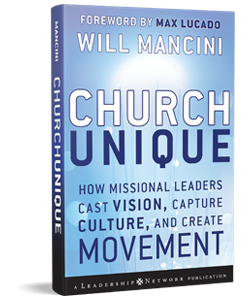 As a result, Church Unique has become a celebrated methodology in almost every sector of evangelical leadership including seminary classrooms, church planting networks, megachurch leadership teams, and denominational-based resourcing. 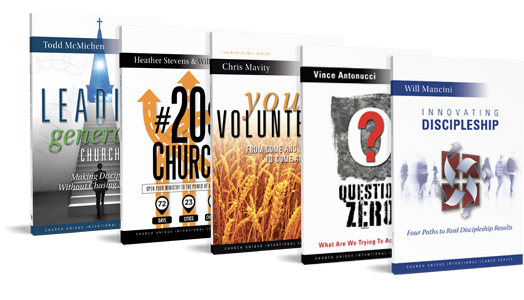 As a result each of these books can be read in one setting but will change your leadership for the rest of your life. Contributors to date include Chris Mavity, Vince Antonucci, Todd McMichen, and Heather Stevens. 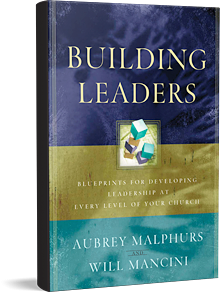 Co-authored with Aubrey Malphurs, Building Leaders provides a step-by-step process for developing leaders at every level in your church. You will find an incredible balance of both biblical foundation and practical help. On the biblical side you will find unique research like an examination of the language that Jesus uses to train leaders without relying on the most common terms for "leadership" in his day. On the practical side you will find tools like a comprehensive list of the 16 basic "venues" for developing leaders. To date there is still no other tool that provides a comprehensive "how to" approach on this critically important subject.